Can you believe? : "Don't skip to the end." 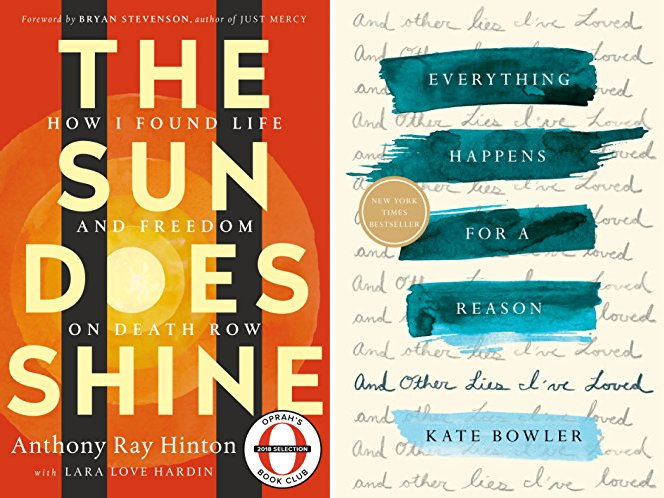 I'm amazed at how a phrase from one book (Kate Bowler's Everything Happens for a Reason and Other Lies I've Loved) can also shine a light on another very different book (Anthony Ray Hinton's The Sun Does Shine: How I Found Life and Freedom on Death Row). I'm not going to tell you where Bowler uses the phrase -- consider it a tease to get you to read the book. It's just a clue to an important insight that both authors illustrate unforgettably: Whether we are on death row, or facing stage four cancer, or simply are privileged/condemned to love someone in either situation, don't stop living. On a Moscow subway escalator, I once saw a t-shirt that proclaimed: "You always have a choice." (I agree with this, most of the time. Sometimes I think, "Among those choices are the choice to reject cliches on t-shirts.") Deciding to make choices was a crucial moment for Anthony Ray Hinton, three years into his 30-year ordeal as an innocent prisoner on death row -- but it wasn't a shiny secret weapon to overcome all the betrayals that had led him to that ordeal. Nor did it deliver him from the roller-coaster of hope and crushing disappointment as the state of Alabama continued its legal campaign to deliver him to the executioner no matter what. It didn't keep his mother alive long enough to see his ultimate vindication. But he had the choice to remain alive, aware, persistent, never losing sight of the truth that he was innocent. He claimed the choice not to give up and "skip to the end." Beyond that legal story, and interwoven with it, is Hinton's account of spiritual and psychological survival on death row, the unlikely friendships he made, the biblical faith he rejected and then re-examined, the book club he started, the decisions to forgive, the refusal to accept any shortcut that didn't acknowledge his innocence. Kate Bowler's story has very little outwardly in common with Ray Hinton's. She's a young respected author and seminary professor, a Canadian transplant in North Carolina, and not a convenient suspect in a racially-compromised murder case. But she too faces a lethal deadline: the universe has conspired to impose an untimely death sentence in the form of cancer. The cruelties she experiences are different from Hinton's, but they're real. Cruel irony: as an academic, she's a student of the prosperity gospel movement. More than just an "objective" scholar, she has immersed herself in churches shaped by this heresy (my word, not hers) and as a result is subjected to all the ways that movement explains non-prosperous outcomes. Even though she herself is anchored in healthier theology, she can't help hearing the exhortations and accusations: Everything happens for a reason. All things work together for good. God has a better plan. Our God is a God of victory. And the constant invitation to self-doubt: It's me, isn't it? There must be unexamined sin. Wherever I have lived in North America, I have been sold a story about an unlimited horizon and the personal characteristics that are required to waltz toward it. It is the language of entitlements. I'm not sure that black families in Alabama were sold exactly the same story, but in both books, we receive amazing raw intelligence about how the authors confronted life's lack of guarantees and found deeper anchors. Please read them, if you haven't already, and receive their hard-earned, non-glib encouragement. Felix Culpa and our moral comportment. The Grinch who stole Thanksgiving? On this Earlham School of Religion leadership resources site, I found a (pdf) report on a consultation on discernment, containing a conference response I wrote over three decades ago. It's an odd sensation reading my words long after I'd forgotten writing them. Over one-fifth of Russians live in poverty, about 28.3% live comfortably. Half the country lives between those zones. Here's RFE/RL's summary; here's the original report with many more stats and charts concerning income and income inequality, the labor market, patterns of consumption, and more. TechRepublic's guide to holiday gift-giving. Being a nobody while being yourself. Sam and Dave in full thanks-giving spirit.